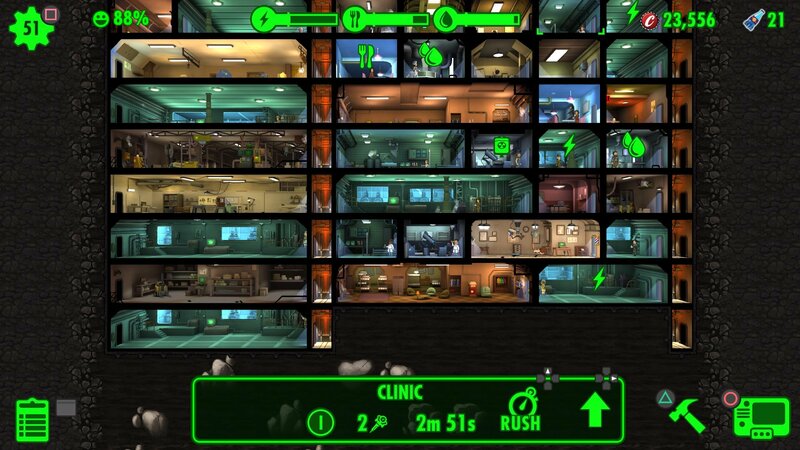 I’ve been obsessed with Fallout Shelter for so long now! Thanks to PlayStation hosting the video! I attempted two times prior to play this on my phone and I just didn’t get it, it felt too much like watching an ant colony and I kept feeling like I wasn’t doing it right. I figured I’ll get it on the PS4 as it came with a free PSN package which comes with a pet carrier, a Mr. 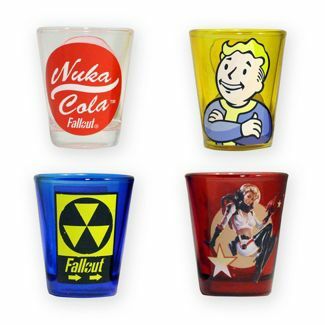 Handy, a six pack of Nuka-Cola Quantum, and five lunchboxes. 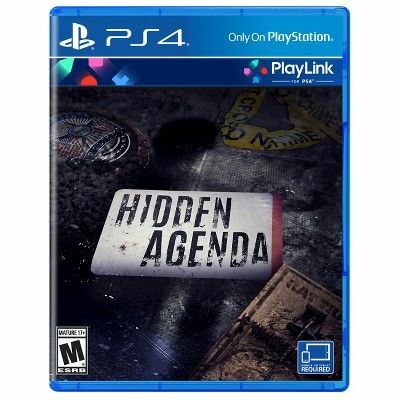 Thanks to the following link from Playstation’s website for having the contents information. For providing what was exactly in the pack as I knew it had lunchboxes but that was about it. Last night, I finally got 50 dwellers and I performed my first haircut and got my second one started so I can get the trophy to get ten hairstyles and then I’m done with that room. I wasn’t even tempted to play it when Todd Howard announced at the end of the Bethesda E3 conference that Fallout Shelter was coming to PS4 but then I saw people were getting the platinum for the game already and I was like, trophies?! So I looked into and downloaded and again, had a rough start to it. 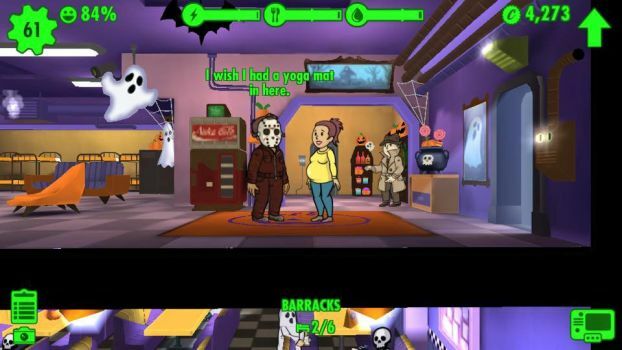 Then I got my 18th dweller and the game changed completely for it. With 18 dwellers, you get the Overseer’s Office and can start sending people on quests. 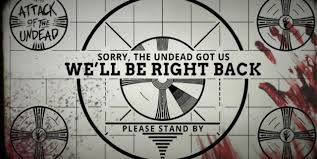 Which meant the game finally became a Fallout game in my mind. I got guns and outfits and I’m finally figuring out how to maximize my vault. As I’m not trying to get the best items or best outfits or be overly powerful in the game, but trying to make the best vault possible is something I stumbled to get accomplished. I think I’m finally got a good spot with it. The weakest weapon I have for my vault is a minimum of six, I finally got the handle on what outfits to put on people. At first, I wanted to put everyone in the handyman outfit for the plus three Agility but then I finally understood the “best room for your dweller” mechanic. So people who are operating a Power Station, should be wearing clothes with a focus on Strength. People in cafeterias should be wearing Agility outfits, and people working on RadAway and Stimpacks should definitely be wearing Intelligence outfits. I have tried to play on my phone again, just because I get the game now but since I can’t cross play with my PS4 vault and my mobile phone, the stakes are not as high for me or my phone doesn’t feel real in my mind, there is a disconnect there. 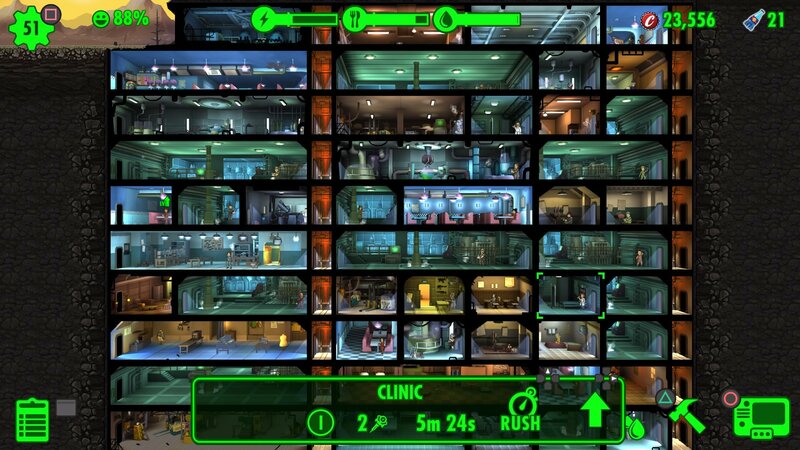 I would say, my vault on my phone got higher gear faster than on the PS4. I had three pretty great weapons rather quickly. The game can go on forever but I’m just playing until I get the platinum, and I’m not sure if I’ll go longer than that as I’m already feeling the itch to play other games. The game really should be played for like 20 minutes and then try another game but I find myself playing for a solid hour and then having a hard time getting away from it. I finally also got a handle on rushing a room, and when the best time to do that is. 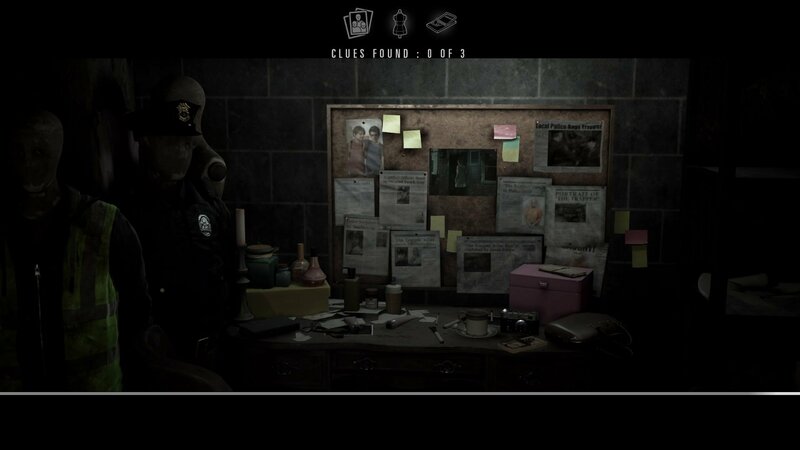 You’ll collect a resource, either Power, Food, or Water, and the best time to rush a room, which means to try to get more resources, is right after collecting from that same room. Don’t rush the same room more that the one additional time. I have a hard time keeping my power high enough, I can get my food and water fully green but power seems to be the resource I’m constantly attempting rushes with. I also don’t rush rooms if the percentage of failure is over 35% and now I’ve started only doing it as high as 31% failure rate as now I’m dealing with radscorpions, which they start appearing once you have 50 dwellers. Which knowing that, I was putting off getting up to 50 until I got them decent weapons and now, I don’t worry too much about radscorpions, pending on where they appear, it is either a prolonged fight or a rather quick one but I have to monitor the fight to cure my dweller of radiation or to give them stimpacks for their health. I don’t get attacked by Raiders as much as I like, I’ve read that is most people’s last trophy to accomplish. They start appearing at 61 dwellers. Which is a great resource to read and review, I would credit them for finally helping me click with all of the information and then Pressing X was great for the visual element. A fun habit I’ve gotten into is timing the game so that I can send people out on a quest, saving my Quantums – which in this game, speeds up travel times – and by the time I wake up or can play again the next evening, they are at the quest and ready for me to play. Or they are on their way back to the vault and I can get them ready the next morning though that doesn’t seem to be working out for me irl. I’ve been tending to be staying up later and hitting my snooze button too many times and lose my window to play the game but still, they are there when I need them when I get to play again. I’m finally at a place where my stimpacks are at 55 and my RadAway is at 35, which I don’t tend to need RadAways as much but now that I’m doing quests or sending one person to the Wasteland, I’ve learned I can only send them out with a maximum of 25 so I wanted to make sure I could at least have over 55 stored. I was giving my person who goes into the Wasteland like five or ten but now I’m going to start giving them the full 25 and seeing how far out they can do. That lady finally hit level 50 so now I have to take her power armor, her gun (a flame torch), and her dog and give it to another lady to start getting leveled up and gathering caps and resources for us. One eye opening situation was sending a team out to do a quest and one of them died, like quickly, and I had to start taking the game more seriously, which is what spurred me trying to figure out what hazards I was going to come up against. I had to start gathering guns and now I can craft weapons so now I regret all of those items I scrapped or sold as I was desperate for money and for storage space. Now, I have plenty of storage space, I have 112 items and a maxed of 200 and I can easily build up another storage room. I have a tap of 65 dwellers so my plan is to open another living quarters to get that number just over 100 as I need 100 dwellers to build one of each room and from there, I’ll probably stop building rooms. I do like how many of the trophies are for things you will do anyway, just that you need to do more of them to get more trophies like complete 60 quests. One of the harder ones is to scrap 500 items but doing quests and sending folks out to the wasteland, should help with that, I’m only sending the one person out to the wasteland at a time, besides my quest team, eventually, I might send out two, if I could get a second suit of power armor. I haven’t built a theme so I don’t really know what that entails, I have the room to do it but I don’t have all of the fragments to make a theme much less, have enough to make all four themes so that’ll take a while too. The collect 20 legendary weapons and outfits, should be easier now that I have stimpacks for days but I’ll want to make another Medlab so I can get more of those as 55 will go rather quickly. I need to do better to skip an objective with my free daily pass as I’ve been sitting on the same three for days now. Two of them, I’ll eventually do, complete six quests and send five people out to the wasteland, which I could have easily done and maybe I will once I get home. I’m sort of at this awkward place where I have 50 rooms and 50 dwellers so each room has a person in it. Well, it might be like 55 rooms but I don’t have anyone in the storage rooms or the living quarters unless I’m trying to make babies, then I have people in the living quarters. I’m doing this thing where I’m having all of the babies be born from Mr. Cook but I have a hard time remembering who the original mothers were but I think I finally figured that part out. I have at least five ladies who will give him more children so I went from 45 dwellers to 50 in pretty quick succession, especially once I learned that giving him higher charisma helped with the speed of making babies so he’s always set in the training rooms. I like the training rooms as it gives me five people who I can use to help out in case of an incident like a fire breaks out, radscorpions, mole rats or radroaches – all due to a rush failing. If I’m attacked by raiders or ghoals, my top floors crew take care of those threats. I was doing it wherein whoever was in the neighboring rooms would help with the incidents but I started noticing that they got XP from assisting with the threat. If they are training, they increase in their SPECIAL stats but were not getting any XP so they were not leveling up. Since learning that, I’ve started only using my training crew to help with incidents so that they can earn whatever small amount of XP that is, as I know I’ve started doing that for a week now and none of them have leveled up, as far as I can tell. I can’t express how thrilling it was to get that Overseer’s Office open and started doing quests, it was so much fun and my learning curve for this game was like, super low. Which I don’t now why, as the tips and the in game tutorial seemed pretty straight forward but it just wasn’t clicking with me. So I can send my training peeps out in the wasteland and get that one objective fixed in a hurry. Pretty much, whenever I send someone to the wasteland, when I turn the game on again, I know that person will be dead so another thousand caps to relive them and then they come back to me. Apparently they will auto return once they have 100 items but I haven’t had that happen yet. I didn’t get the trophy for the lone wanderer reaching level 50 but I’m hoping it will trigger once she’s back in the vault but maybe it has to be someone in the vault actually leveling 50 or she wasn’t one of my original folks but I believe I’ve only ever been given one dweller who didn’t start at 1 so who knows. I’ll get it eventually. With quests, I’ve started just doing the lower ranked ones and working my way up, I was going to do it by one mission at a time, as there are like eight story quests where each one has like seven chapters per over all mission. But then that one guy died so quickly that I had them all come back and changed out I approached quests. You are given a daily quest and a weekly quest to work on but my dwellers are not there yet to take those on. We’ll get there eventually but my highest weapon only goes up to 15 damage, maybe 22 but it isn’t much. Even if a dweller who was sent out to the wasteland got 100 items, I wouldn’t have enough space for all of those items but I’ll just build more storage in that scenario. This is the habit I’ve gotten into. 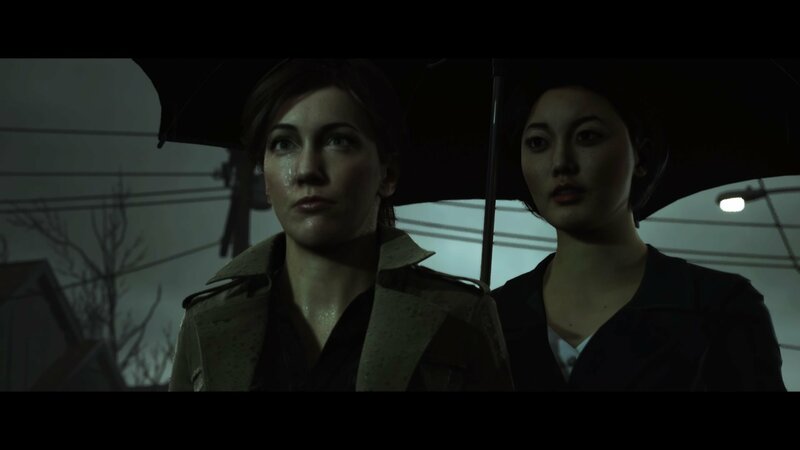 I turn on the game, I load Vault 129 (Kitty Pryde’s first appearance! ), and I quickly gather all of my resources, from top to bottom, leveling up people as I snake my way from floor to floor. My two Mr. Handys are on the top floors but I usually get to those before they collect the resources on the floor for me. When I earn my third Mr. 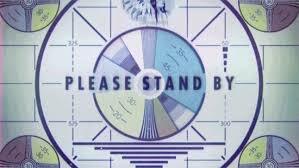 Handy, I’m going to send him out to the Wasteland, all it can gather is 5,000 caps but I’ll be happy to get 5,000 caps every two or three days and then he’ll auto returned and I’ll just send him right back. I had 22,000 caps and then I hit 50 dwellers and put into place my plan to open a three wide power station, one medlab, one science lab, the barber shop, and another power station (I really need more power). All of that, plus the two elevators, cost me essentially 12,000 caps. I got the trophy to increase 20 rooms to level 3 so now I’m no longer increasing rooms as with each increase, if an incident is to occur in the room, that room is either doubled or tripled the threat. I had thought I had to leave a person in the barber shop, to be the official barber, but there is a machine that does the styling, so now I do have a bonus dweller who I might just put to the wasteland or into another room to get her experience. 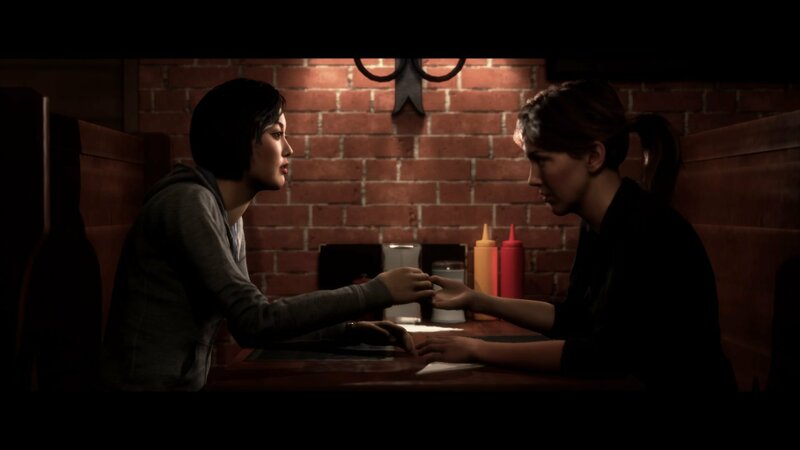 Right now, she’ll go to whichever room the person I grab to get their haircut next was in so that I can get the 10 haircuts trophy but after that, she’ll either be in her own official room or sharing a room or outside doing her thing. 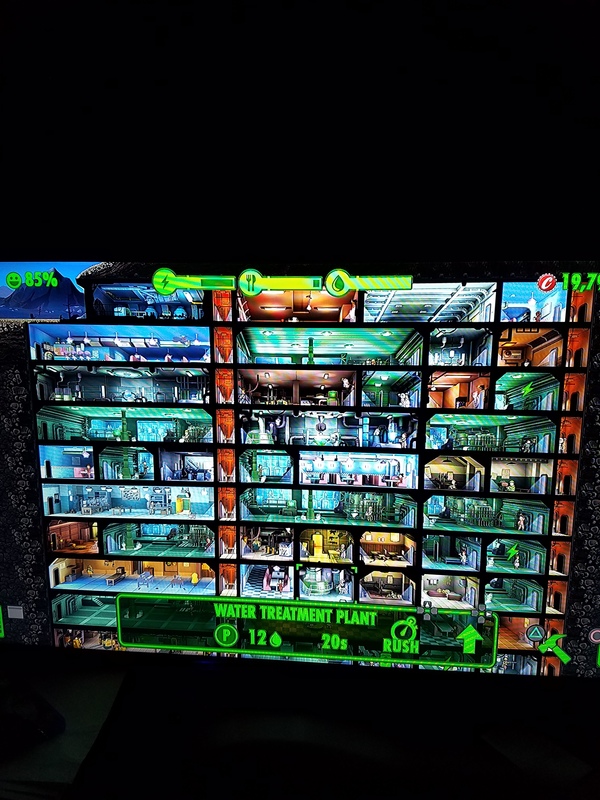 My next floor, when I get 10 more dwellers, probably all from making babies, will consist of storage (probably a two wide), living quarters (another two wide, or whichever gives me 100 dwellers as an option, so a two wide but increase it by a level or two until the 100), another medlab, I’ll hold off on a science room and then whatever that room is that you unlock at 60. 60 dwellers unlocks Nuclear Reactor, which will replace my power generator rooms. Some people take the time to destroy rooms and replace those rooms with the higher tier rooms but I imagine I won’t do that. Mainly because it is extremely expensive to do so, as I’ve been tempted to destroy my left side of the vault to put elevators on that side. I accidently clicked a new elevator on the right side and was going to destroy it but I had enough money to go all the way up and it has been hugely beneficial having it on that side. But the reaction time to get someone from the middle to the top floor isn’t that bad, plus my training rooms are on the right side so it all works out. Typical me, I’ve become quite obsessed with this game too. So I’ll gather all of the resources, which pretty much is in every room. I was crafting weapons and outfits but I’ve built the ones I wanted and now I’m awaiting resources to make even better weapons. I’ve made all of the outfits that I didn’t already have, I should double check to make sure I have all of the weapons crafted as the game keeps track of weapons, outfits, pets, and dwellers that are obtainable. I’ll click on people to level them up and give birth in those circumstances. So gather resources, try to craft new weapons or outfits, I’ll add new haircuts for the next eight times, I’ll start watching for any rooms to provide a new resource so I can start rushing those, if I don’t have water completely filled up, then I’ll rush those rooms but I definitely rush food and power rooms and food almost always gets filled during a game session. Power though, if I stay in the game for like two hours, it’ll be close or fully filled. I’ve since learned that if an outfit as luck, there is a high chance of getting caps from collecting a room, so now I’m trying to change outfits to incorporate a luck stat. I do all of that so that I can check on my two outsiders. I make sure my quest team is ready for the quest, and then I check my wanderer, who is most likely dead. If dead, I revive them and recall them back to the vault. Then I’ll check on the vault, as a few rooms will be ready within a minute or two. Once every room has been collected again or I have dealt with any incidents, then I finally check on my quest team and start the quest. Do that and come back to my vault and recollect all resources. From there, it is a waiting game to try to earn another thousand caps and call it a night. I play on mute as the sounds can get pretty loud and repetitive so I rely on the controller vibrating to let me know the mysterious stranger has arrived. If you click on him, you can get bonus caps. Thanks to FlyingScull for providing the above image on DeviantArt. I wanted to find an image that had the bars at the top, they have 11 more dwellers than me but around the same happiness level of 84 to 86%. I haven’t played on Halloween or Christmas but apparently there are special events on those days, including outfits. I’ve also found the game to be so much easier to play on the PS4 than on my phone, I blame my giant man hands or lack of nails for that. You don’t need a huge reaction time but you do need to have the ability to press a person and then be able to move them to another room. Not being able to do that can cost you a person and reliving them can be as cheap as 100 caps or as expensive as 800 caps, pending on gear and level – from what I can gather. 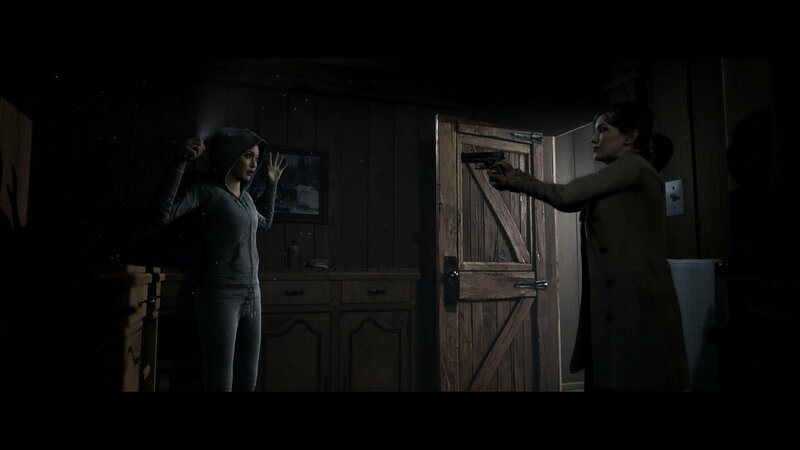 Sorry for the poor quality, I have to figure out how to do screen grabs through the PS4 and then upload them to Twitter, as that’s how I’ve read others have done it. One would think there would be a mode within the game to take a screencap of your vault to share with the community but maybe there is and I haven’t found it yet. I’m suffering for power and I keep adding more and more three room power sources. I finally made another three room storage to have a total of 230 but I’m at 150 items right now so I’ll probably be making another three room storage again relatively soon. I also made a three room residence so I can have up to 106 dwellers so that’s one less room I have to make going forward. I also got my ten haircuts trophy so I don’t need that room either but I’ll keep it for keeping its sake. I keep getting attacked by radscorpions due to having to attempt so many rushes to get my energy into the green bar again. I need to make at least five more babies, to man a few more power generators. I’m trying to keep those new ones at the first tier so they can handle the threats. I definitely don’t think I’m ready for deathclaws yet so I have to get better weapons by the time I get 60 dwellers. I unlocked Sarah Lyons so I have 51 dwellers and she’s in power armor, naturally, so she is out in the wasteland. I keep sending my one gal at level 50 which I like that idea, so I think I’ll keep doing that with my level 50 peeps as they should be able to handle themselves in the wilderness. I’m going to have to make another medlab so I can get more Stimpacks but I do enjoy how everything is finally coming together, I just need more power! I figured out how to upload from the PS4 to my Twitter account. I had to had another storage unit as my three wasteland peeps did not end up dying and are rocking out there and gathering so much so I have 203 items with 300 total capacity. I really have to start getting rid of stuff but I don’t want to until I can figure out what I really don’t need. I try not to keep any outfits that I have more than four of, so I’ve been scrapping those and any weapon with a power of six and under. I keep getting low on power so I had to upgrade my power generators from tier one to tier two. I’ll have to make like five more babies and just go crazy with power generators. I just don’t want any of my rooms to go dark. I’ll pump up my other storage unit to a second tier as well as that will give me 346 total space which doesn’t seem like much so I’ll have to either spend the additional 1500 for more space after that or make another three wide storage unit. 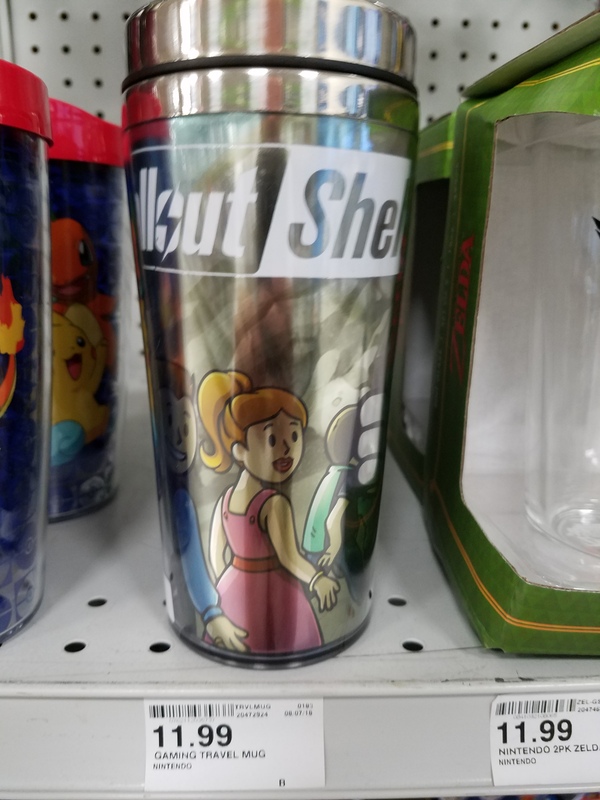 Shopko has this travel mug that I can’t seem to find anywhere online. For $12, it isn’t that bad. It is too tall for my coffee maker but I could simply transfer from the mug to the Fallout Shelter Travel Mug. Even Bethesda’s official site doesn’t have it on there. Shopko also got a magnet and an air freshener, both five dollars. I bought the magnet but I go back and forth on the air freshener. 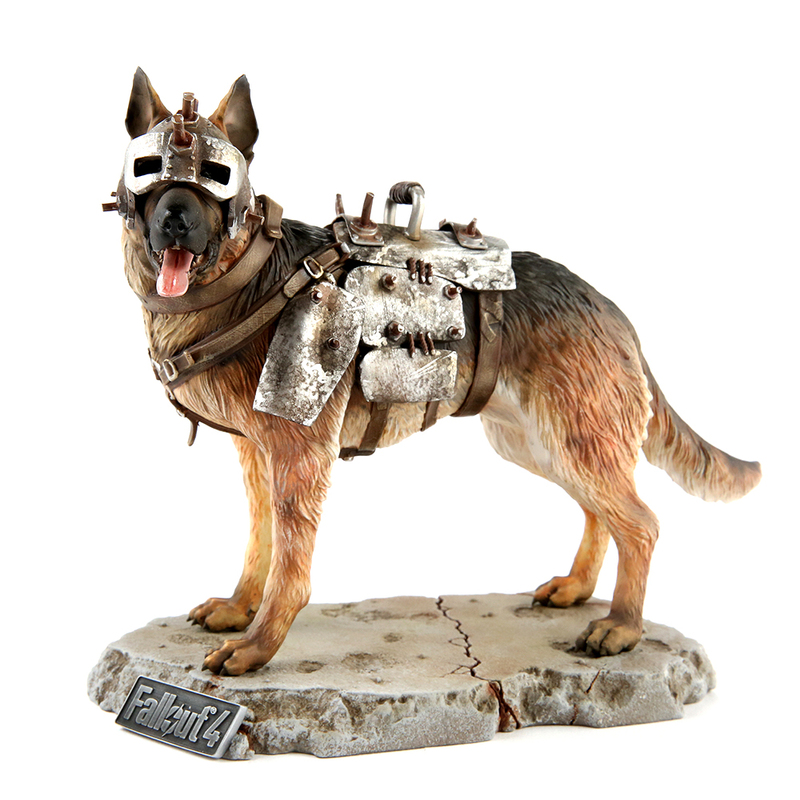 I was slated to buy the travel mug with my next paycheck but now I really want to save up for Gamestop’s exclusive Dogmeat statue. Forty dollars for this great looking statue seems super reasonable to me! 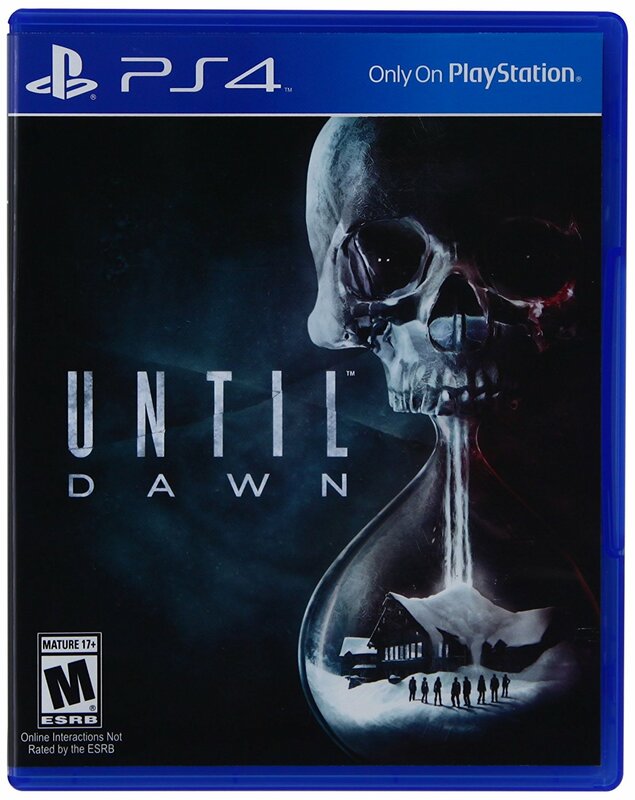 My wife has already politely told me she won’t buy it for me, which I get, I already have twenty put aside so next payday, put another twenty aside and go straight to Gamestop to reserve it. I imagine doing it through the store means no shipping so it would be a straight forty and it looks amazing! After that, I’ll get the travel mug. I still go back and forth on Fallout 76, it sounds amazing, I’m way into the Fallout franchise, to the point where not owning it seems like an odd thing for me not to do. My issues with griefers seems to have been handled, I just probably won’t get it day one or heck, by month two (unless as a Christmas present). By the time I can own it, it’ll be well tested. I’ve been pretty loud about how all I really want for Christmas is a sixty dollar PSN card so I can renew my subscription as that thing pays for itself after the third month of free games. But if I can get the $80 game, that would be a swell present! My son and I are deep into season two of Knight Rider. He’s a big fan of KITT Rider. 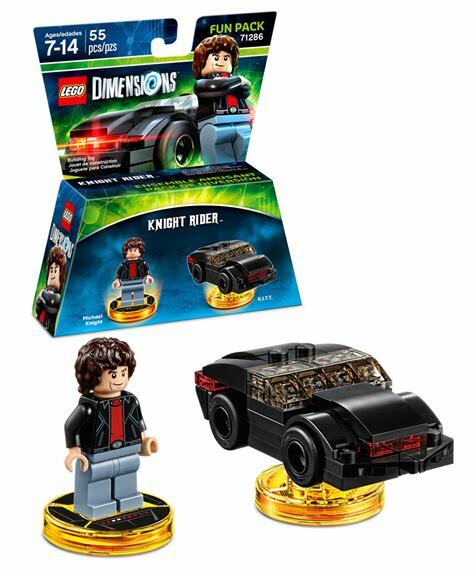 I finally came across the Lego Dimensions Knight RIder Fun Pack at GameStop. Which, of course, he loved. 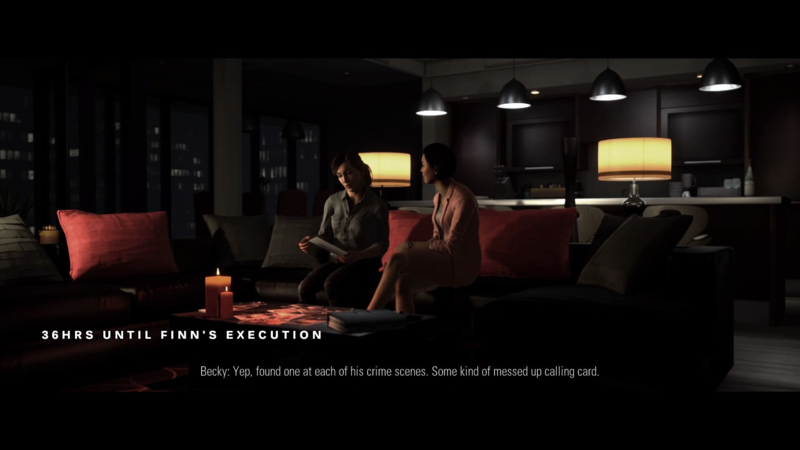 Which, also of course, started making me want to see how it played in the official game. My lovely wife found the game on Amazon for $40, down from like $120 when it first came out, so for Valentine’s Day, we got it for him as a gift. It was going to be an Easter present but I couldn’t wait that long, plus, I was hoping we could get some sets for Easter. He’s really into Ghostbusters now so I’m hoping to get one of the sets for him so he can get Echo-1. We bounce between Classic Knight Rider on the NBC app, Real Ghostbusters on Netflix and 2008 Knight Rider whenever he points to it on the NBC app. I can’t get a feel for his routine when it comes to the new show. I read that it gets the feeling of the classic show, after the 13th episode but we’re on the fourth episode so we’re never going to get there. Thanks to HappyThumbsGaming for hosting the video. That way, my son didn’t have to wait until we got the game to build KITT. That would have been pretty unacceptable. I knew there must have been instructions somewhere online for it. The packaging tells you how to build Michael Knight, not like one couldn’t figure it out on their own. When he was carrying around the box the mini-figures came in, he really wanted the other two versions of KITT that can be made with his pieces. Which, if they were like three dollars each, I would totally buy so he could have all three running around. Still a super missed opportunity the show never had Garth drive KARR, probably would have happened in the fifth season. Seems like an obvious choice but maybe too obvious? Would have been a cheap episode to do as well, it really writes itself! In the game, Walker Dennis really don’t like KITT not being in his proper build but we need him to be a truck sometimes (for tolling purposes) and a jet (for flying purposes). So I usually transform him back. Walker Dennis is really obsess with Bad KARR and wanting to see him in the game. Thanks to kwingsletplays for hosting the video that contains the KARR storyline. The game is super fun and as soon as it instructs you to place the characters on the gamepad, you can throw Michael Knight and KITT on it and paly from the very beginning. 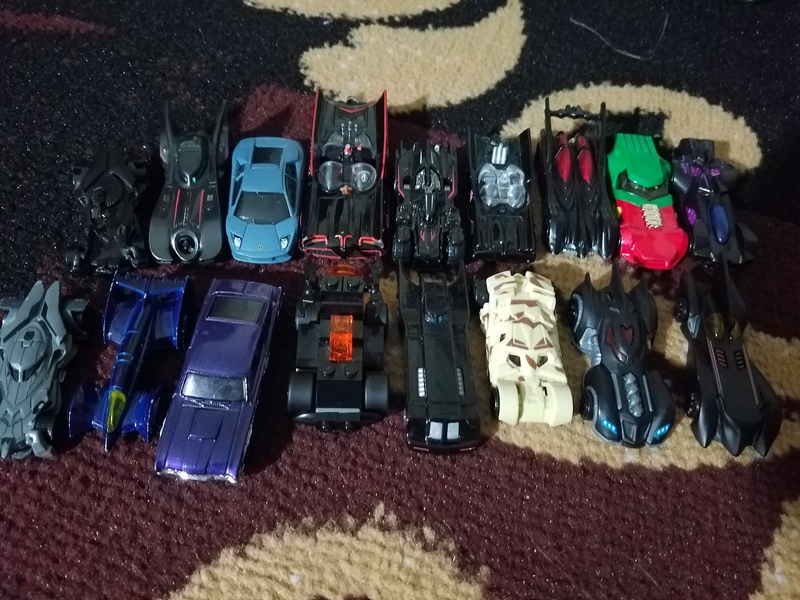 It olds seven pieces and we have six with those two and Batman, Gandalf, and Wildstylez, plus the Batmobile so its pretty fun having all the characters on the screen at one time. We haven’t played in a while but I’ve been having an itch to do it. And it doesn’t take much time to swap one game disc for another, I’m just lazy about not wanting to do it. As I couldn’t find any real information on the Knight Rider world, which makes sense as how many people were super excited to buy the fun pack but I wanted information and only really found the one FAQ. 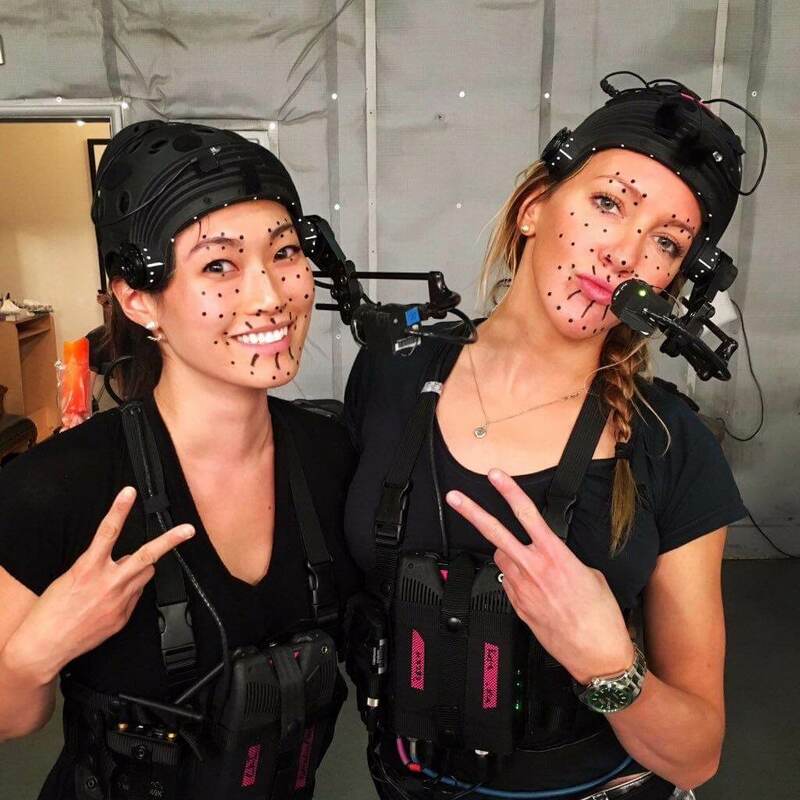 So the most important characters will be Hermione and Mission Impossible’s Ethan. They will get you access to half of the gold bricks. I also know at some point, you’ll need the Goonies pack and the kids are helpful towards some of the gold bricks too. There is an air race that I can’t seem to get activated. I could when I had Michael Knight jump through it so maybe I need a flying character that doesn’t require a vehicle as KITT Jet can clearly get me up there but then nothing. Which lead to me really putting studs towards him. 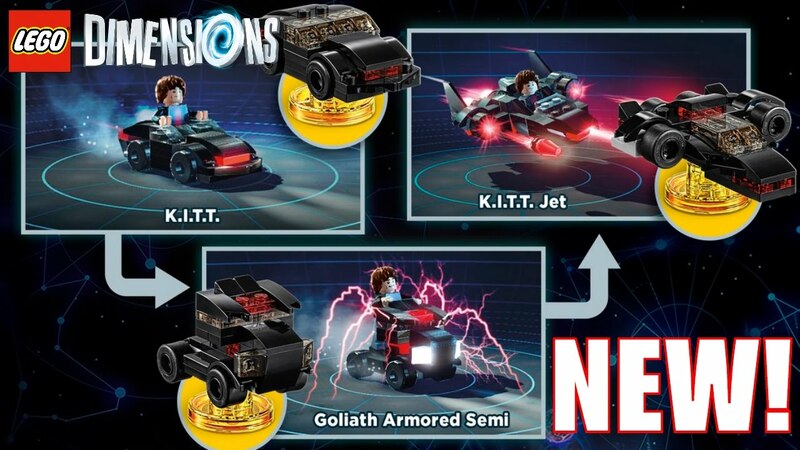 So Hermione and the Mission Impossible set are on my short list, up there with the Doctor / TARDIS / K9 set. 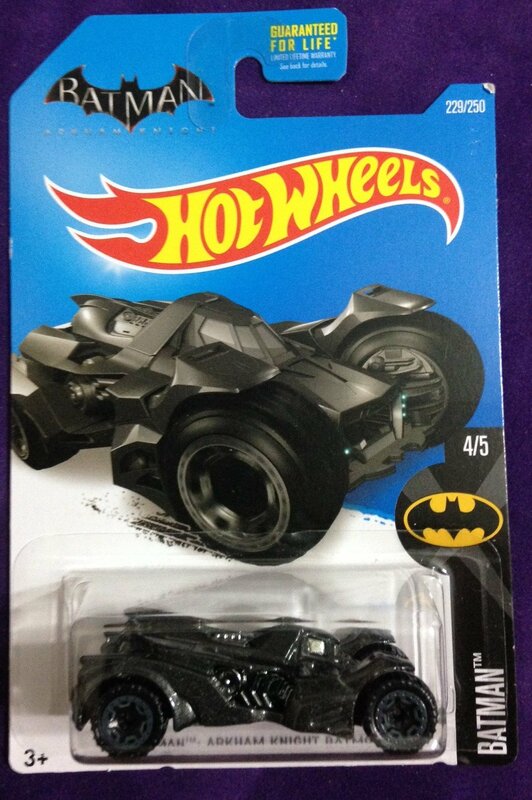 I wanted the Scooby Doo one but then I ended up buying Walker Dennis a Hot Wheels Mystery Machine so he’s good now. In game, I’m pretty much stuck on the Simpsons level, not stuck, just not made any progress but clearly I don’t have a lot of characters as I’m missing out on several items that need key characters. I got KITT pretty powered up, having all three builds unlocked. That was a high priority and I’ll probably stick to unlockables for the Knight Rider World to dedicate what I purchase next, except for sweet deals I come across, which I haven’t come across any. I thought for sure it would be happening with the news that the game isn’t being supported anymore. I’m hoping to buy a slew of items while they are on sale or on clearance before they become rare collector items. As we like Arrow, I would love to get the Green Arrow figure for the game but he is a costly fellow, just like Supergirl, another one I would like to own. My wife would like to get all of the Harry Potter folks and the Lord of the Ring sets, so those would be nice. Walker Dennis wants the Ghostbusters ones as he’s all about the cartoon, Slimer, and the Stay Puft Marshmallow Man. He really enjoyed the movie, not as many ghosts or Slimer as I remembered but that film really holds up. Back to the Future, I’m a fan but my son would just want the DeLorean figure. Portal 2, my wife and I loved that game. I wished GLaDOS was an option. Doctor Who, I really enjoy the idea that all 12 (13 with the War Doctor) Doctors are represented whenever the Doctor dies. Shame they can’t update the disc to include the new 13th Doctor. Ghostbusters, as long as we get an Ecto-1, one way or the other. Mission Impossible, just because Ethan Hunt is required for several of the Gold Bricks in the Knight Rider World. The Goonies, I like the film enough but we need the Skeleton Organ for one of the gold bricks in the Knight Rider World. DC Comics, as I want my son to have a Joker to the Batman (that’s how they get you). I wouldn’t mind a Teen Titans Go! for Raven and Beast Boy but they are not a high priority. The Lego Movie Bad Cop just for the police car. DC Comics, I’ll want the Wonder Woman, Superman and Bane ones but I’ll be fine with Cybord and Aquaman too, especially if they are pretty inexpensive. Harry Potter, for Hermione Granger, I would just pass on the Team Pack, if it was up to me. Which it is as my wife isn’t even watching us play and Hermoine checks a lot of boxes. I’m sure Ron would have been planned for Year 3, if they were given the chance. It looks like a big list but really it boils down to Doctor Who, Hermoine, and Mission Impossible. From there, I’ll have to see which characters I’ll still need for the gold bricks. I do like how they have a Powerpuff Girls Team Pack and a Fun Pack so you can get all three of the girls. Tricky to not just throw them all in and just not have a vehicle but that’s how they get you to buy two of them. Teen Titans Team with Raven and Beast Boy and the Fun Pack with Starfire would be fun, once we got the Lego Batman pack with Robin. Without Robin, that team doesn’t quite come together in my mind. Shame there is no Flash representative, especially with Supergirl and Arrow having figures. I’m sure he would have been part of the third year. Other fun ones would be A-Team for that sweet van and Back to the Future for the train. Here is what would have been part of Year 3. Looney Tunes would have been nice for me but Walker Dennis doesn’t have any real conncection to them. I should work on that. I tried to get him into Tiny Toons but starting with the pilot wasn’t smart on my part. I’ll try again if it is still on Hulu after we get done with Ghostbusters, if we ever do. Season One has 75 episodes alone! Though I’m ready to jump out once they become Slimer & the Real Ghostbusters. Kong and Godzilla would have been fun, though I wonder how that would work in the levels themselves. Probably just much smaller? We probably would have eventually gotten all of the Arrow-verse sets. Probably would have added the Hobbit to our wishlist. Year Three would have been ambitious with Willy Wonka (for some reason? ), Matrix, Planet of the Apes, Jaws, Jetsons, and the Flintstones. I just found out that Hot Wheels made the Flintstones car so I have my eyes open for that. I doubt I’ll ever see it while he’s still interested in Hot Wheels. Which I hope he never outgrows that hobby. Year Three would have been pretty fun! There is a severe lack of information on TMNT Legends. The main thing I was looking for was which characters cause Focus Meter Down. 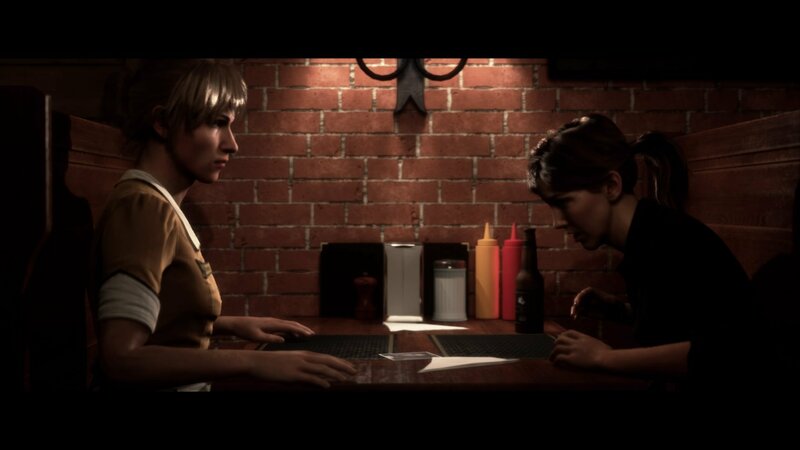 Once a character’s Focus Meter fills up, it is that character’s turn. As I’m trying to get better in the game, a constant grind but I’m committed to it at this point, I was looking for a team that solely caused Focus Meter Down. So I turned to my pals at reddit for assistance. A reddit user, Sh3Si was a huge help in compiling a list! The ones I remember are April (basic move), Spiderbytez (basic move), Casey Jones Movie (basic move), Creep (basic move), Slash (5th move AOE – Area focus down) and Larp Raph (2nd move, 5th move AOE – Area focus down). All Classic Turtles do guaranteed focus down on basic move BUT only against their respective class advantage. I knew April and Creep, and that’s when I had the thought that if I could get three more, I had a pretty decent team there. I do like that these characters have the ability attached to their basic (first) move, so when I click the button when the game just does my fighting for me, it can happen automatically as the game focuses mostly on first moves. When I have a character I’m trying to level who has an Area of Effect (AOE), that’s when I control the game as it just speeds up the process. Having a team of more than one AoE character just makes me so happy. As soon as I unlock a character or a move with AOE, I level that move as high as I can for the most damage. are not the worst team, I just don’t have Jones nor Bebop in the third tier yet so they are maxed out at level 30, whereas the others are at 45/44. I do finally have a team of five that can get to level 46 – Baxter Stockman, Nick Raphael, Rahzar, Stockman Fly and Shredder, so once I commit to getting them to level 46 and higher, I can progress through the story mode, so I’m finally at that point. I’m just letting the first one naturally hit 46 as once that happens The Gauntlet is going to be even harder for me. It really isn’t a bad team, Stockman has two awesome AOE attacks, Nick Raphael is a beast now that he has his fourth tier move where he attacks back, Shredder has a decent AOE and he and Stockman Fly are healers so that’s to two healers in that party. Rahzar has a move that gives him critical attacks, if his health stays up, which is pretty often and for a couple rounds. I have Baxter to the fifth tier so he has all of his moves available now and he is platinum now so that’s pretty great. Raphael will get within 15 days as will Rahzar, I’m not sure if they’ll get platinum-ed as that requires 10,000 T-Coins which is a lot of T-Coins (but I have those) it is the platinum shards I’m lacking but there isn’t any rush with that. I’m almost got enough silver shards to take Snakeweed from Bronze to Silver, so that’ll be nice too. Ludia keeps denying me Classic Shredder as a Tournament prize, it looked like they were heading in that direction with running all of the Classic Turtles, which finally gave me Classic Raphael (I’m still missing Michelangelo as it takes 70 DNA to unlock him), then they did Classic Bebop and Rocksteady. So I thought for sure either Krang or Shredder was next. Instead, this week, is Bunny Bebop, which makes sense as Easter is coming. I’m set to get him to the second tier, so I’m not really complaining about that. Bunny Rocksteady should be next week, which will get him moved up to the second tier as well, him or B.U.N.N.I.E.S. a variant of mousers, which will be nice as I haven’t unlocked that character either. 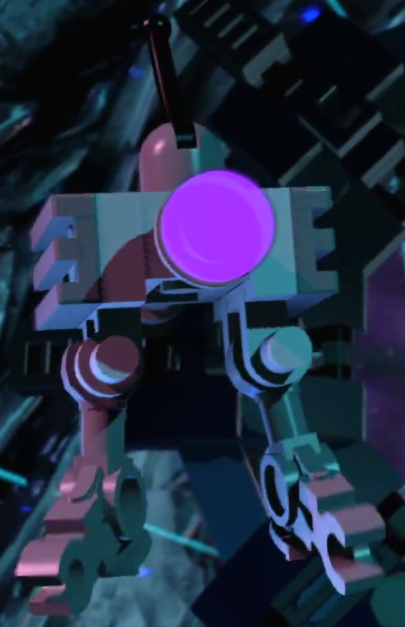 Hopefully from there, we get Classic Shredder but I’m doubtful. I’ve definitely have stopped playing the game that much. I barely play it in the morning, just making sure I get my one Tournament fight in, and at night, I blaze through the daily challenge to get the Nick Raphael DNA card and another Tournament fight as I really need to stay in the third tier of Samurai to get enough Bunny Bebop DNA, but staying in the third tier isn’t a problem for me as I have enough people to stay or get back into that tier.